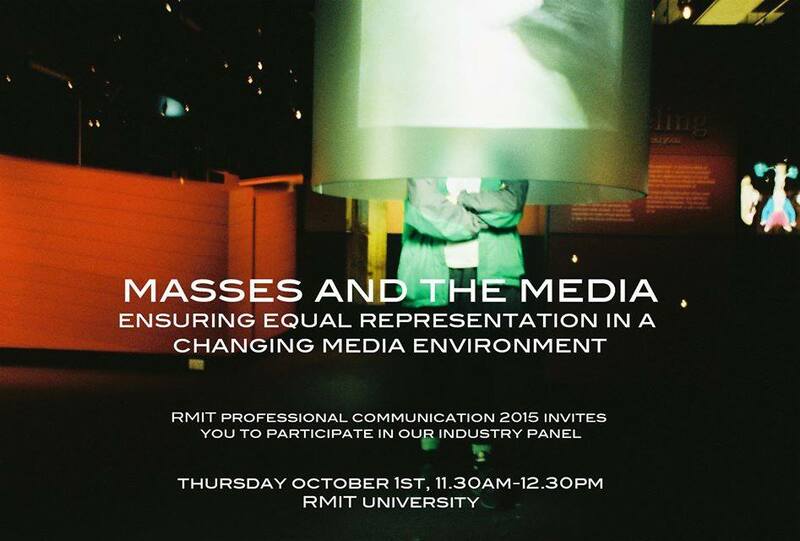 A discussion between media professionals about striving for fair and equal representation of marginalised groups and voices in a constantly changing media environment. New media has opened avenues for diversity to be seen and heard. What is the impact of new platforms and formats? Are traditional media channels more open now? What potential challenges and innovation may we have to look forward to in representing voices and groups that may not otherwise be heard? The next generation of media professionals at RMIT want to enter the industry with an array of tools and knowledge that will help to work towards a more open professional arena for the future. The first step in striving toward representation of marginalised voices across all media platforms and within the industry is educating ourselves. Group members were happy with the outcome of the panel in the debrief we had, pleased at the turnout of audience members and the quality of conversation. Overall, feedback from audience and panellists was incredibly positive. A direct result of moderating the panel and my role as artist liaison was Evelyn Morris asking me to step in and help out as an artist liaison for the Listen conference in early November.